Update (5/10/2015): In a change to casting, Sophie Bevan will now sing the role of Susanna. 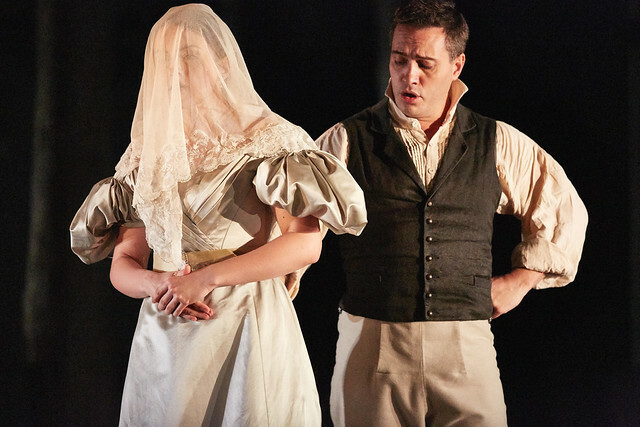 David McVicar’s Royal Opera production of Mozart's Le nozze di Figaro (The Marriage of Figaro) will be relayed live to cinemas around the world on 5 October 2015 at 6.45pm BST. The cinema relay will be presented by actor and theatre director Simon Callow, who will take viewers behind the scenes to explore the music, plot twists and the elegant staging of the production. For a specially selected range of exclusive, films, pictures and features, download the Le nozze di Figaro Digital Programme for free using the promo code 'FREEFIG'. Le nozze di Figaro is an adaptation of Pierre Beaumarchais’ controversial play Le Mariage de Figaro. The plot follows a ‘single day of madness’ in the palace of Count Almaviva in which Figaro and Susanna – a young couple hoping to marry – must fight the advances of the count, who wants to seduce Susanna behind the back of his jealous wife. Mozart composed the four-act opera in 1786, working with librettist Lorenzo da Ponte. Despite being an ‘opera buffa’ and intrinsically comic, the opera also features poignant expressions of the characters’ deeper conflicts. Le nozze di Figaro is now considered to be a cornerstone of the standard operatic repertory and is one of the most performed operas worldwide. Le nozze di Figaro contains some of some of the composer's most moving music, including Countess Almaviva's aria ‘Dove sono i bei momenti’, but there are also playful sections including ‘Non più andrai’, in which Figaro cheerfully sends pageboy Cherubino off to war. The sextet 'Riconosci in questo amplesso’ too is both virtuosic and witty. David McVicar’s production sets the action in a French château in 1830 on the eve of revolution, amplifying the opera’s undercurrents of class tension. The cinema relay sees Erwin Schrott sing the role of Figaro with Sophie Bevan starring alongside him as ‘one of opera’s cleverest heroines’, Susanna. Count Almaviva is sung by French baritone Stéphane Degout and American soprano Ellie Dehn will perform the role of his wife, the Countess. The Orchestra of the Royal Opera House is conducted by Ivor Bolton. After the relay on 5 October, we will publish a roundup of the audience tweets, so share your thoughts using the hashtag #ROHfigaro. Le nozze di Figaro will be live streamed in cinemas across the world on 5 October 2015 at 6.45pm BST. Find a cinema screening near you and sign up to our mailing list. The production is staged with generous support from Paul Cartledge and Judith Portrait.